Expii is made for personal learning. 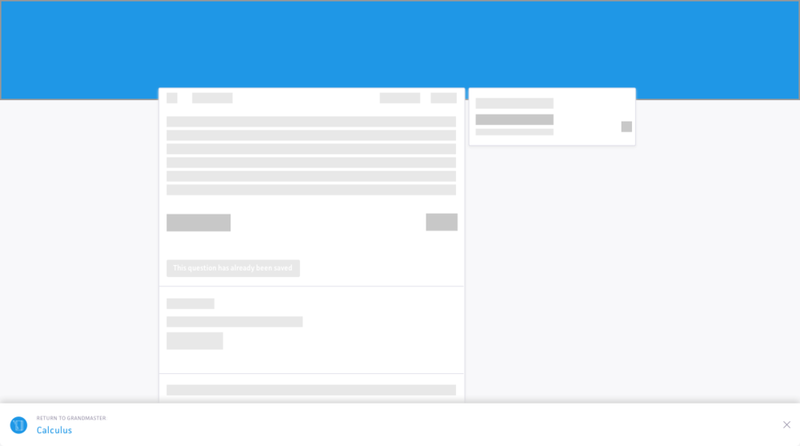 Can you think of ways to improve the current problem solving and feedback experience to convey that we are personalized for every single user's need? Most students keep their previous exams and quizzes to help them identify subjects that they need to review and improve on. 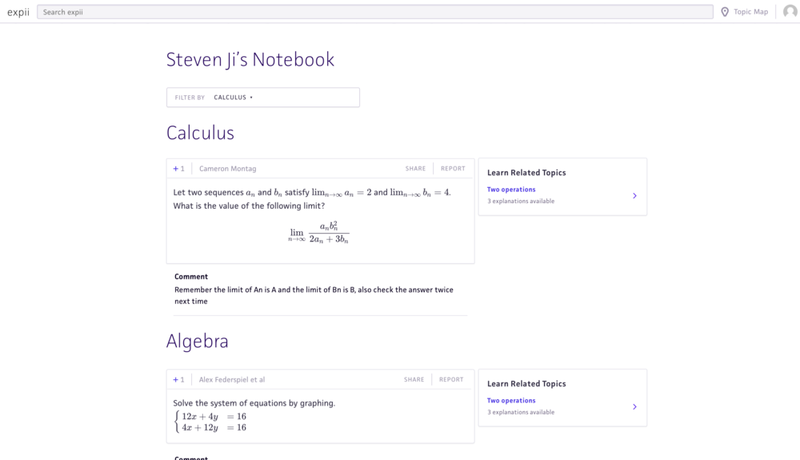 The “Notebook” feature serves as a digital space on Expii that allows students to do the same. It enables students to save questions that are valuable for their improvements in Expii grandmaster and Expii solve. Students are also able to write tips on the questions they saved to help them tackle similar questions better. The first step I took is understanding the vision of Expii. Expii aims to provide a personalized learning platform that caters to the unique ways each student absorbs the subject materials. 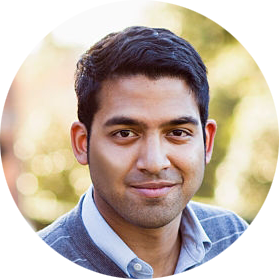 The founder Po describes Expii as a free tutor that every student has free access to. Therefore, I made the association that one-on-one tutor session is the most optimal personalized learning experience. 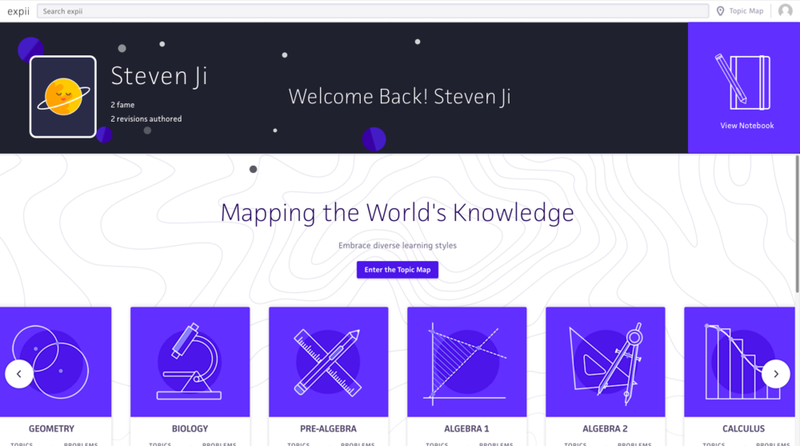 If one-on-one tutor provides the best personalized learning experience, then I would like to identify elements from the experience that make it special and successful for students’ learning and see if there are opportunities to convert it into an online experience that ultimately could help improve the problem solving and feedback experience on Expii. How do tutors provide personalized learning for students and what allows for successful tutorship? To find out more about the information, I interviewed several college students who had one-on-one tutors who have helped them succeed in academics. "It is valuable to have a tutor because they are able to adjust the lecturing speed according to my needs and that they are able to explain the difficult topics in ways that I can understand"
"I think it's the personal interaction. My tutor always asks me if I understand everything before she moves on to the next topic"
"My tutor asked me to keep a folder for all of my exams and quizzes. He and I will go through them together. I understand far better what I need to work on afterwards." From talking to the students, I found out that many tutors start their tutoring session by looking at their students’ past homework assignments. They also ask the students to keep collecting their exams and quizzes.When students fail to answer a question, the question often reflects weak understanding of a topic. Therefore, when tutors see students’ mistakes, they are able to quickly identify what concepts the students fail to grasp and help students improve. What personalized problem solving and feedback experience does Expii currently afford? 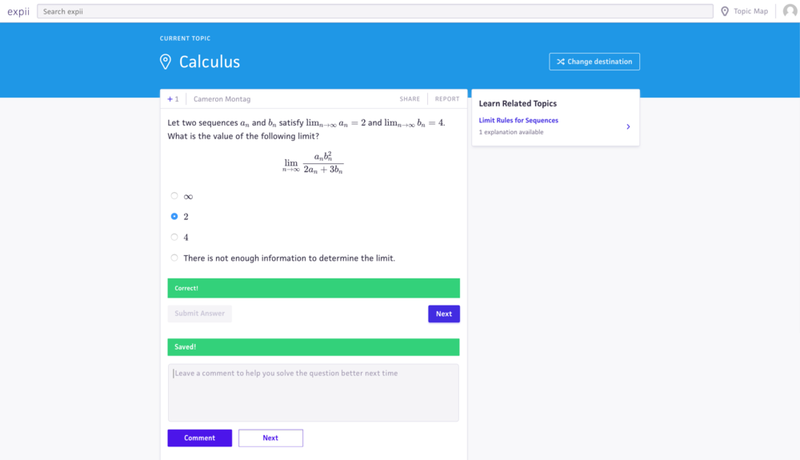 Regarding problem solving and feedback, Expii currently is personalized to match questions to problem solvers’ needs through an algorithm. However, there is currently no personalized feedback mechanism that allows students to understand how they could improve. The tutors are able to understand the students’ individual learning needs through looking at the students’ past works and assignments. Through knowing what type of problems that a student makes, they quickly build rapport to help students strengthen their understanding in topics. Therefore, through their tutorship, many students have raised the habit of keeping all of their assignments so that they learn to use it as an indicator for which topics they need to improve the most. 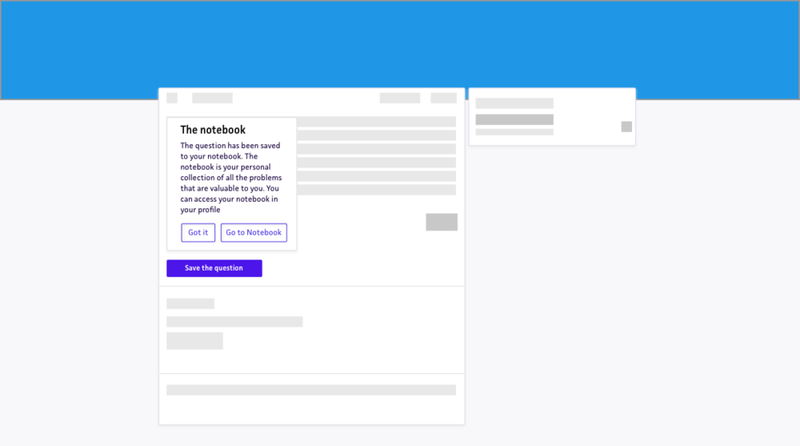 I see this as a design opportunity for an Expii feature that allows students to keep track of the questions they fail to answer and leave comments for themselves on how they could do better the next time they encounter similar questions. My audiences are students in high school and college who have a desire to learn more or to build an understanding regarding their materials. The reason that I created the desktop version first is that I had the assumption that most students use the desktop when they enter “practice/grandmaster". Many practice questions require students to set a side a time and work space in order to work on questions with great focus. Therefore, I prepare to work onto mobile version of the new feature secondarily. 2. He came across a question on sequence and limits, which he did wrong. 3. He saves the question and adds a comments about it so that he can tackle the question much better next time. 1. 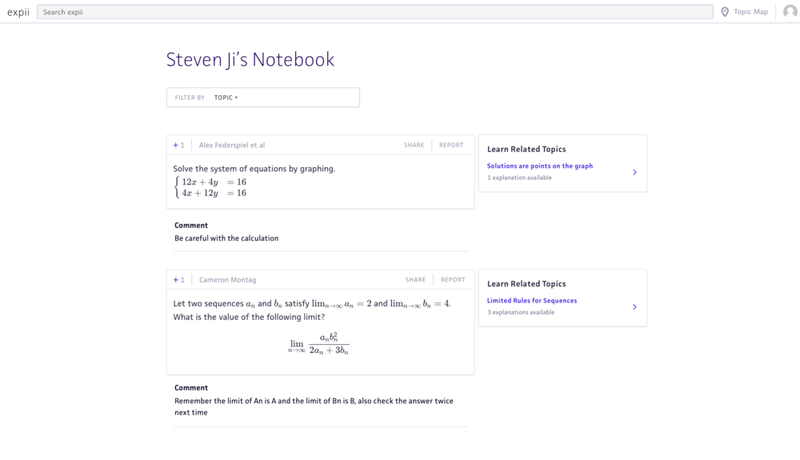 During a study session before the exam, Steven came back to Expii and accessed his notebook on the landing page. 2. He selected the calculus topic so that he could find the question he saved earlier. 3. He accessed the question to review how to do it. A variation of the question is on the exam and Steve knew exactly how to solve it. Flush out the interactions of Notebook to make sure it could fully integrate with existing Expii features and websites. 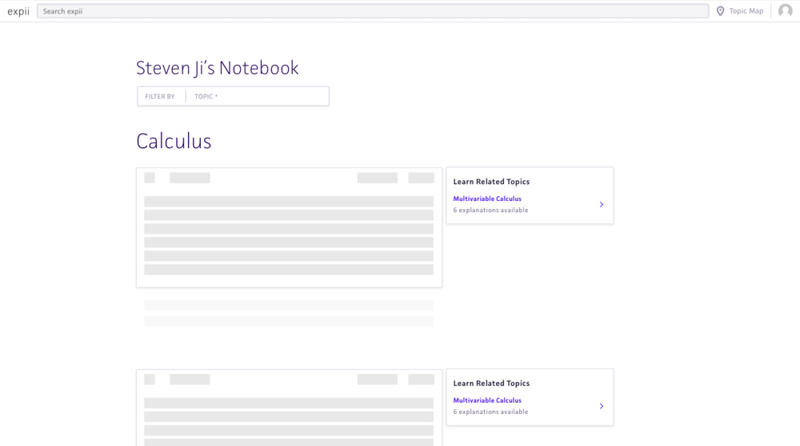 Also, creating the mobile version of Notebook. Even though students study more with their laptop, they can quickly review the questions in Notebook with their phone.